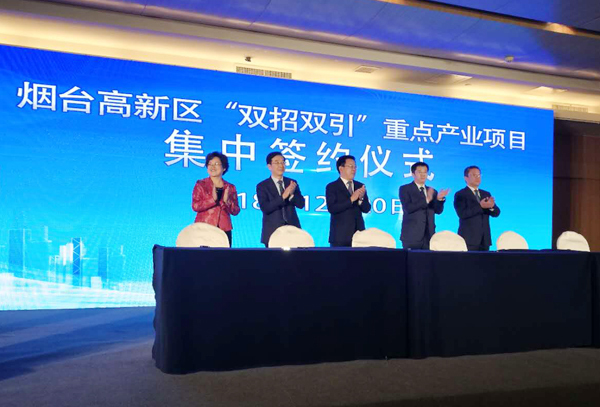 Summary: On the afternoon of December 20th, the signing ceremony for the key projects of Yantai High-tech Zone was held in Crowne Plaza Yantai. Zhang Dailing, Vice Mayor of Yantai City, Party Secretary and Director Li Yanjun of Yantai Science and Technology Bureau, Liu Sen, Director of Yantai Municipal Bureau of Commerce Chen Xinzi, Director of the Investment Promotion Bureau of Yantai City, Yu Dong, Secretary of the Working Committee of Yantai High-tech Zone, and Director of the Management Committee, Yu Dong, attended the signing ceremony. The meeting was hosted by Liu Laiying, deputy secretary of the Working Committee of Yantai High-tech Zone. China Transport Executive Deputy General Manager Han Yong and China Mobile Intelligent Machinery (Yantai) Co., Ltd., General Manager Wang Kun participate in the meeting and signed on-site. 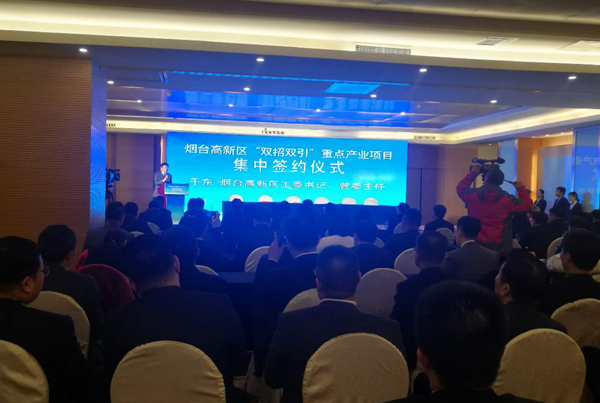 On the afternoon of December 20th, the signing ceremony for the key projects of Yantai High-tech Zone was held in Crowne Plaza Yantai. Zhang Dailing, Vice Mayor of Yantai City, Party Secretary and Director Li Yanjun of Yantai Science and Technology Bureau, Liu Sen, Director of Yantai Municipal Bureau of Commerce Chen Xinzi, Director of the Investment Promotion Bureau of Yantai City, Yu Dong, Secretary of the Working Committee of Yantai High-tech Zone, and Director of the Management Committee, Yu Dong, attended the signing ceremony. The meeting was hosted by Liu Laiying, deputy secretary of the Working Committee of Yantai High-tech Zone. 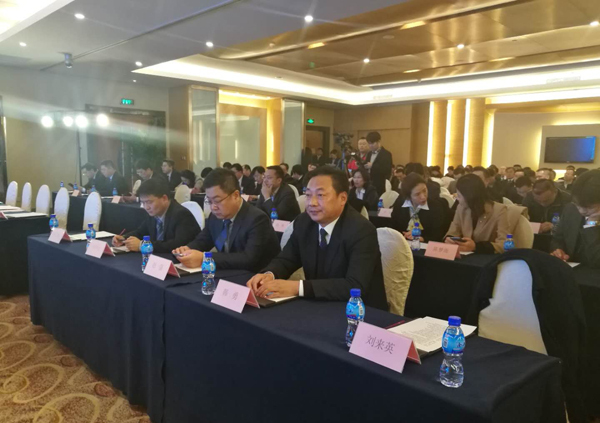 China Transport Executive Deputy General Manager Han Yong and China Mobile Intelligent Machinery (Yantai) Co., Ltd., General Manager Wang Kun participate in the meeting and signed on-site. At the meeting, Secretary Yu Dong addressed the signing ceremony. He first expressed warm welcome to the key enterprises participating in the signing. He pointed out that Yantai High-tech Zone always puts "double strokes and double guidance" in a prominent position. We welcome large enterprises with strength and development prospects to invest in Yantai. High-tech Zone will provide the best policy, the best environment, the best service, and achieve mutual development and win-win. Secretary Yu said that the key projects signed this time are the latest achievements of Yantai High-tech Zone's efforts to open to the outside world and the "double strokes and double guidance" work. The next step will be to increase policy support for these key projects. We will ensure that all service are implemented and work together to accelerate the project construction process. Subsequently, a signing ceremony for key projects was held. 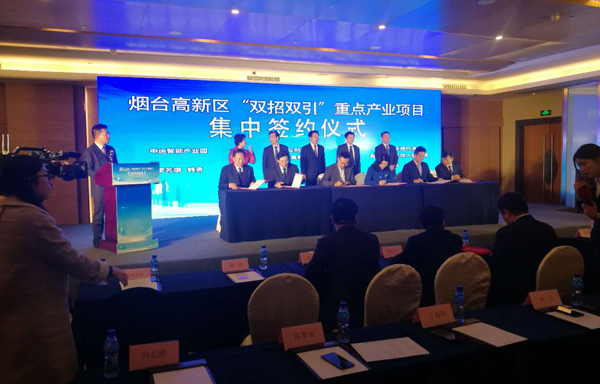 Han Yong, executive deputy general manager of China Transport, signed a cooperation agreement with China Transport and Yantai High-tech Zone on the Zhongyun Intelligent Manufacturing Industrial Park project site. The successful signing of the contract has played a positive role in promoting the project construction in the next step! The Zhongyun Intelligent Manufacturing Industrial Park project, located in the High-tech Zone of Yantai City, is invested and constructed by China Transport. It covers an area of about 95 mu and has a total investment of about 600 million yuan. The project is mainly divided into two phases, including the first phase of cross-border e-commerce projects and The second phase of intelligent manufacturing projects. The Industrial Park relies on the rich operational experience of China Transport in the cross-border e-commerce and e-commerce platform and its technological advantages in industrial informationization, intelligent manufacturing, big data, cloud computing, etc., and actively promotes existing machinery in Yantai and surrounding areas. Traditional industries such as manufacturing, vehicle and ship manufacturing, and auto parts have upgraded and replaced “informatization + intelligence + globalization”, promoted the transformation of new and old kinetic energy, created new engines for development, and fostered new development momentum. After the project is put into production, it is expected to train about 2,000 senior technicians and cross-border e-commerce professionals every year to solve the actual employment of 1,000 students. Mr. Han said that the Zhongyun Intelligent Manufacturing Industrial Park project is a major strategic deployment of China Transport to develop intelligent manufacturing and improve manufacturing levels. It is also a milestone in the history of the Group's development. In 2019, our Group will break through and fully attack. Promote the construction of the project and concentrate on creating a high-standard “cross-border e-commerce + intelligent manufacturing industrial park”!